The hemiptera include, cicadas, aphids, shield bugs, bed bugs, pond skaters, water bugs, cuckoo spit insect and many more. Have piercing mouthparts, called a rostrum which contains 2 pairs of stylets. The outer 2 pairs (the modified mandibles and maxillae) have serrated edges for piercing, and the labium and labrum form a tube around the stylets for food to pass up and saliva to pass down. The tip pf the rostrum has receptor cells to assess the suitability of the food source. Mouthparts usually fold under the body like a clasp knife. Adults usually have two pairs of wings, the front pair may be partially hardened. The plant feeders can be serious agricultural pests as they can transmit viral diseases. Body length from 1 mm to 130 mm. Divided into two sub-orders; Heteroptera and Homoptera. Cuckoo spit is made by a Homopteran bug. Over 82,000 species worldwide, over 8,000 in Europe, 1700 in the British Isles. Honeydew is the sugar-rich liquid excreted by some sap suckers in this family, e. g. aphids. The "manna from heaven" in the bible is believed to be honeydew. The taxonomy of the hemiptera is confusing, and is constantly being changed. In many books they are subdivided into 2 groups as above, however this division is often changed to incorporate extra divisions. Wings entirely membranous or hardened. Includes cicadas, leafhoppers, froghoppers, aphids. All homoptera are plant feeders. Wings divided into 2 parts, one part being leathery. Includes shield bugs, etc., bedbugs, water striders, pond skaters, and other water bugs. Below left is a heteropteran land bug. Their bodies are generally flattened, with the wings folded flat over the body. 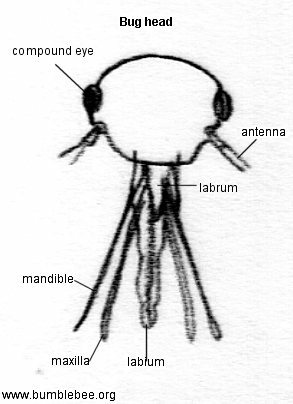 The mouthparts (stylets or rostrum) form two channels allowing food to be sucked up one and saliva to be pumped down the other (see the diagram of a bug head on the left). Shield, assassin, lantern bugs etc.